Water sampling and testing procedures provide information that can be used for the following purposes: to ensure the protection of the water system equipment; to prevent unexpected system failure; to provide information used to control water quality; and to verify that water treatment chemicals are maintained at the proper concentration within the system or, if not, to allow for adjustment of their concentration. Adequate chemical treatment of water systems requires that specific levels of specific chemicals be maintained in the water to provide the system with protection from corrosion and deposits. This requirement applies to both cooling and boiler water systems. The purpose of a sampling and analysis program for industrial water is to ensure and verify that the required levels of treatment chemicals are being maintained and that the water quality parameters are within the specified control ranges. Learn the typical locations for water sampling in a steam boiler water system. This course is intended for mechanical engineers and other design and construction professionals wanting an introduction to water sampling and testing of industrial water systems, such as for cooling towers and boilers. This course will give mechanical engineers and others an introduction to criteria, procedures and equipment for sampling and testing industrial water systems. This course provides introductory guidance for testing and sampling industrial water systems. 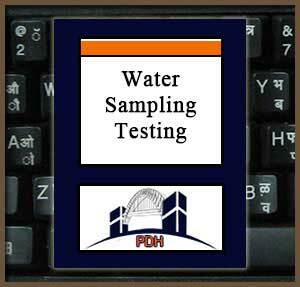 After completion of this course you will have an understanding of basic methods for sampling and testing water systems.